At DSID we've implemented an easier, more streamlined method for writing in-office messages. Now you can login to your own DSID account via our website from any computer or device with an active internet connection, and type as many messages as you want. Sixty seconds later they'll show up on your digital signage. 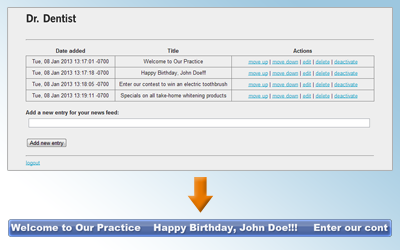 This feature is great for welcoming patients, wishing them happy birthday, highlighting a promotion, or whatever else you can think of. This is all achievable with a fast, easy, real-time method. In addition, you can deselect messages that you're not currently using, and reactivate them at a later stage, rather than having to delete and rewrite all the time. If you're an existing client and you have not yet taken advantage of this incredible feature, contact DSID today to receive your login details.